If you are looking for a custom written operating agreement for your limited liability company (LLC) then look no further. Nicholas Coriano has helped private & public companies establish the guidelines for their business entities by writing operating agreements for clients throughout the USA. 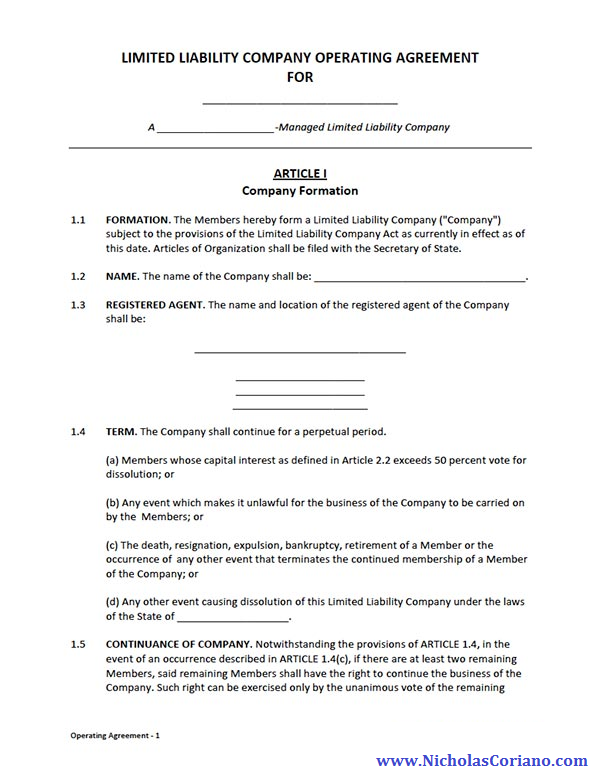 An operating agreement defines how the L.L.C. will be run, voting rules, member rules and most details of how the company will operate. An operating agreement can be utilized by limited liability companies to assure managing members and limited members of their rights and duties. An operating agreement is an agreement among limited liability company ("LLC") members governing the LLC's business, and members' financial and managerial rights and duties. Many states in the United States require an LLC to have an operating agreement. LLCs operating without an operating agreement are governed by the state's default rules contained in the relevant statute and developed through state court decisions. An operating agreement is similar in function to corporate by-laws, or analogous to a partnership agreement in multi-member LLCs. 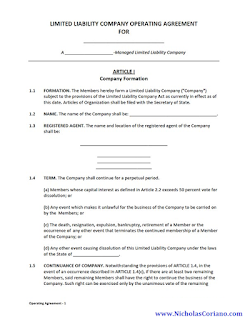 In single-member LLCs, an operating agreement is a declaration of the structure that the member has chosen for the company and sometimes used to prove in court that the LLC structure is separate from that of the individual owner and thus necessary so that the owner has documentation to prove that he or she is indeed separate from the entity itself. Limited liability companies are very flexible in nature and the operating agreement defines each member or manager's rights, powers, and entitlements. This includes capital accounts, membership interest, distributions of profit and allocated tax responsibility, etc. This internal document is an agreement set by the company members that contains provisions for critical items and rules that run the company. Operating agreement s can be amended at any time by the company members or managers. Writing an operating agreement can be cumbersome and timely and the details can easily be overlooked by a founder or company management. A proper operating agreement is broken down into sections called "Articles" and each Article outlines sections of the business. For example Article 1 would be definitions, where the agreement defines terms that are referenced throughout the Operating Agreement. Article 2 could be titled "Company & Business" which would outline facts such as the company name, founding members, date and State of organization, principal office, registered agent, etc. Article 3 could be titled "Management of Company" and could include managing members, duties of managing members, limited liability of managing members, etc. Did you know that an operating agreement can outline payment terms for investors and managers? It can. It can also limit the liability of managers taking on an investment. If you have a Limited Liability Company and no operating agreement you could be at risk of legal liabilities even if you are the only member of the limited liability company. Timely and cost effective, operating agreement writing services are available for LLC's in all 50 States. Email Nicholas today by clicking here or by texting/calling 203-685-0346 to schedule an appointment for a free consultation.